If you haven’t ridden the rails in a while or if you’re not served by the Pink or Green line trains, chances are you may not have experienced the new 5000 series rail cars yet. Opinions are squarely split down the middle on the configuration of the seating, but there are some other aspects that aren’t getting much attention that I wanted to talk about here. First some background. 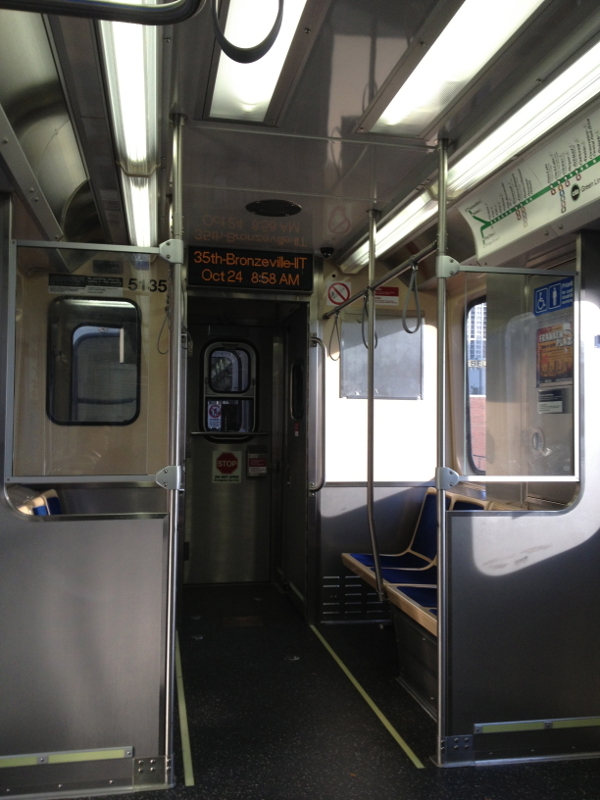 The new rail cars seem to be part of the CTA’s effort to bring our heavy-rail transit system up to the standards that Washington D.C.’s Metro system set in the 1970s. On the system end, Federal Transit Authority and American Reinvestment and Recovery Act dollars are helping to remove slow zones on the Red and Blue lines (the backbone of the city) and take the Brown line (Lakeview, Wrigleyville, Far Northwest Side) out of the 1930s. Also, the CTA finally has tracking equipment/software with an API that lets developers create applications to gauge arrival times. At most rail stations and some large bus kiosks, arrival times are also on large LED displays, which is a huge humanitarian improvement for everyone as individuals can finally estimate approximate arrival times without a phone. Judging from my past experience, the CTA doesn’t typically handle communication with customers too well in the case of catastrophic rail delays (e.g. train fires, derailments, police action, etc. ), as I have often entered subway stations or boarded stationary trains and sat there like an idiot waiting for service to resume without a word from employees over the PA system. However, since smart phones have become more common, they have made a good effort to allow developers to take whatever information is available and distribute it via apps (sadly, the CTA’s own web interface is frequently broken). Also, I have heard that under the presidency of Forrest Claypool there is a huge push for customer service, courtesy, and cleanliness. Now, on to the new rail cars. The CTA is getting several hundred at the cost of $1.14 billion dollars, which I guess is a steal. Apart from the seating, which I will get to in a minute, there are some other changes. Usability enhancements such as LED information screens (which display the next stop and the current time) are at both ends of the rail cars and there is now a flashing light that blinks when doors are about to close. While these are necessary improvements for persons with low or no hearing, they are convenient for all riders. Now, on to the most comical of the enhancements, the light up system map that reminds me of two things: something out of Epcot center in the 1980s, and the map of nuclear power plants in Homer Simpson’s office. I have bracketed the red LED that indicates the next stop (bottom right) because it is almost impossible to see at any distance. My very first thought was “What the hell are they going to do if a new station is added or a station is shut down?” and I have yet to come up with an answer. I guess they will have to either replace those panels or drill some holes and slap on some stickers as the transit system changes over time. 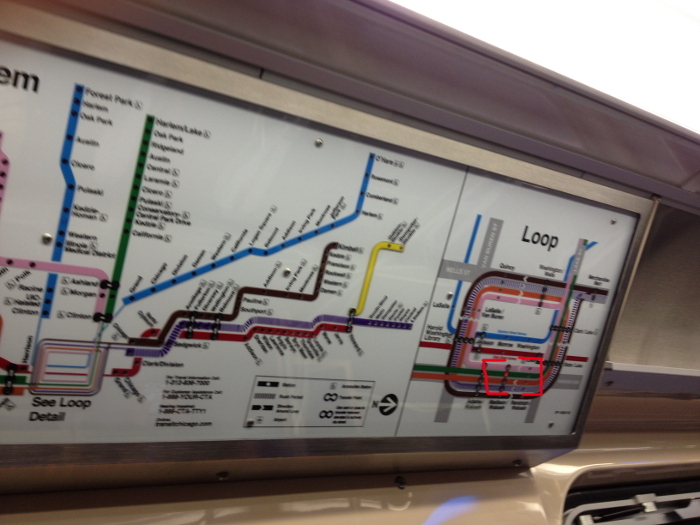 More importantly, the map is located at the midway point of the car on only one side, which will be functionally invisible to most passengers on a crowded train (I myself noticed it only on my second ride). It’s an odd decision at best, and an expensive boondoggle of a bureaucrat at worst. At least there is a clout job in it for someone to change all those tiny lights as they burn out (if anyone from CTA is reading, I have experience installing light bulbs and, yes, I am interested in a high paying job replacing those lights). Onto the seating configuration. The entrances are now free from seats as well as the highly unusual divider that is still present on some Blue line trains which divides the two folding doors and prevents anyone from entering/exiting comfortably. It makes much more sense to have that area freed up, both for persons in a wheelchair and for persons who want to stand with bikes; likewise, you can fit many more passengers in that area. On my rides, however, I noticed that passengers tended to congregate at the entrances still. This must be force of habit, as the cars have many more convenient handholds in the form of vertical poles and dangling loops in the interval between the doors. Lines on the floor clearly demarcate where standees should be in order to keep the isles clear, which seems like a small thing, but is important nonetheless. Consider when you line up at a bank of self-checkout kiosks at the supermarket: there is a great deal of confusion, anxiety, and frustration when it is not clear where you should be standing (for conscientious individuals at least). The seating is similar to what I experienced in Boston: aisle-facing bucket seats. From what I hear, in New York the heavy rail has aisle-facing bench seating (New Yorkers feel free to correct me). Anyone who’s sat in a bench seat in a car knows the downside: when a turn happens, you slide right into the person next to you. The disadvantage of bucket seats is that there are discrete spaces you can occupy, which means you’re probably rubbing shoulders with the person next to you. Neither is ideal, but benches at least give people the option of spacing things out themselves (with or without bags and parcels) as opposed to bucket seats in banks of three (vertical poles separating each bank), which are pretty rigid on how much space you are occupying and how you can sit. I suppose like most public seating, benches encourage people laying down, which is a serious issue as homeless people looking for a comfortable sleeping surface and jerks looking to take up all the seating space will be all over that. Seat dividers ultimately keep people upright. My suspicion is that if there were more outreach on the part of the CTA as to the layout of train seating, people would have a much easier time accepting the configuration. The CTA usually follows the bare minimum of public feedback: a few public hearings at inconvenient times/locations and some vague announcements buried on their website and in small print on 8.5×11 sheets on buses. Even though we are stuck with the seats we are given, I know that city residents are not modest about their opinions on public transit decisions, so I encourage you to tell me and the CTA what you think about the Railroad of the Future. *Sorry I do not have more pictures. I don’t have time to photoshop out faces. If you want to see the whole interior of the car, here is a pretty good image of what the whole rail car looks like.